Do you have kids? I do. I have two. A girl and a boy. From the moment the baby girl was born, she had Gastroesophageal reflux (GERD). What that means is that the acid can move up from the stomach and can inflict the burning pain from the stomach and even up to the throat. It is quite common in newborns. In most – mild cases, GERD is gone within a couple of months. That did not happen in our case. There were nights when I couldn’t sleep because she was in such a pain. My daughter wouldn’t stop crying because of the pain and soon she stopped drinking milk completely. Long story short, as it is, everything is ok now and she grew up to be a young healthy elementary school student. It is almost as GERD never happened. It is fascinating how our brain works. Bad memories are quickly forgotten and only the good memories remain. Until something happens. Somethings, a trigger can make you easily remember. In my case, that is when I hear her cry. I can hear her cry from far away, I would immediately recognize it’s her. Now that she is older she doesn’t cry or at least she hides doing it. It was Wednesday evening, I stayed in the office as we had planned a scheduled maintenance. On that day we kill the power and test the generator, UPS, backup and so on. At 21:00 we gather in the office, do a plan and start. It is in everyone’s interest that we start when planned. Staring late means being late at home. What being late means is also being late in the morning (am 03:00-am 06:00). 5 minutes before we started, I received a call: Daddy daddy, help me, please. It was my daughter, crying. Blackout over my eyes. What happened, I asked? I forgot to create a power point presentation and tomorrow I am presenting in front of the class. Surely you know what to do, right? Yeah, but the computer is not working. Ok, I said, no worries, let me connect to your computer and we ‘ll fix the problem. Tell me your TeamViewer ID and I will connect. A couple of minutes later, I have downloaded and installed TeamViewer. I connected to her computer and several minutes later I got a warning from TeamViewer that commercial use is detected and that it will disconnect. Bummer, my computer is part of a domain, so that would make TV suspect commercial use. There is no way I would fix the problem in a minute. Everybody was waiting for me in the meeting room, now what? Moments like can really make your heart rate go up. If there is a problem there is always a solution. I keep repeating this sentence to my kids. Luckily I found CloudBerry Remote Assistant. 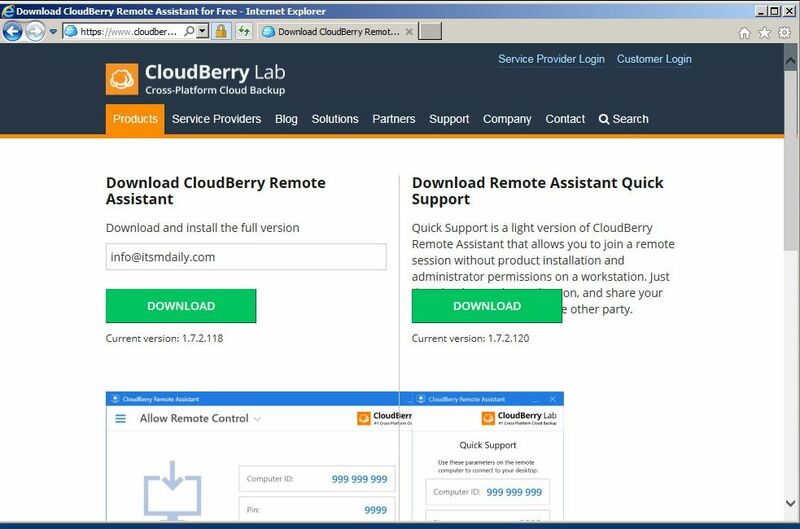 CloudBerry Remote Assitant is a free TeamViewer alternative, which features some unique features. Did I mention it’s free? Let me show you how I quickly solved the problem on my daughter’s computer. First, visit CloudBerry Remote Assistant website. 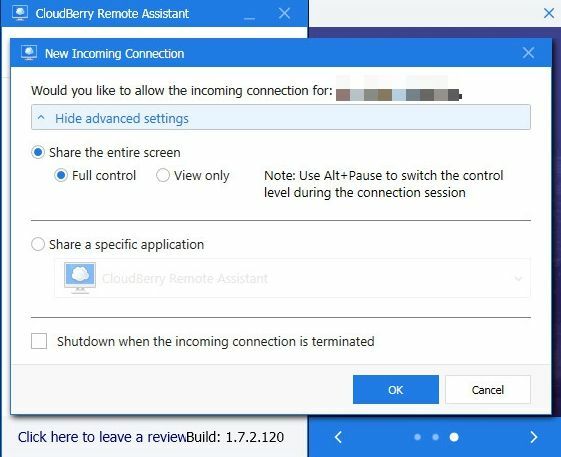 You can download the installation package which you can use to connect to another computer or Quick Support module only, a program which is used so that other computers can connect and provide support. After the installation, you will see a program very similar to the TV. You can easily share your screen. You will find a Computer ID and a Pin code. 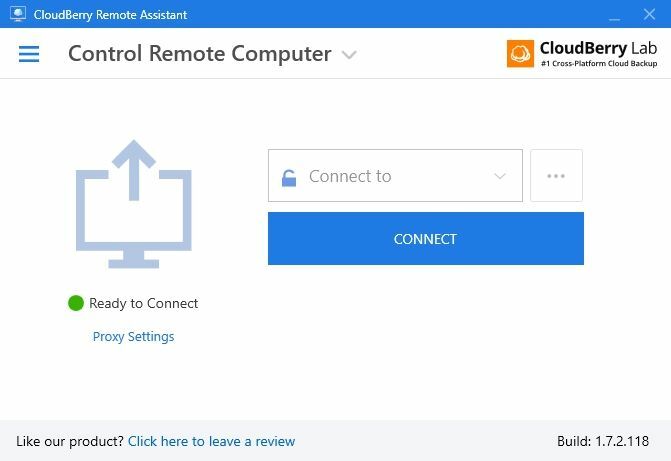 If you want to connect to a remote computer, you have to change Allow Remote Control to Control Remote Computer by clicking on an arrow beside the text. If required, you can limit the sharing of the screen. You can enable Full control or enable View only. In addition, you can limit the screen to the specific application only. That way a viewer can’t maximize another application by the ‘accident’. Another feature which is very welcome for elevated security is encryption. 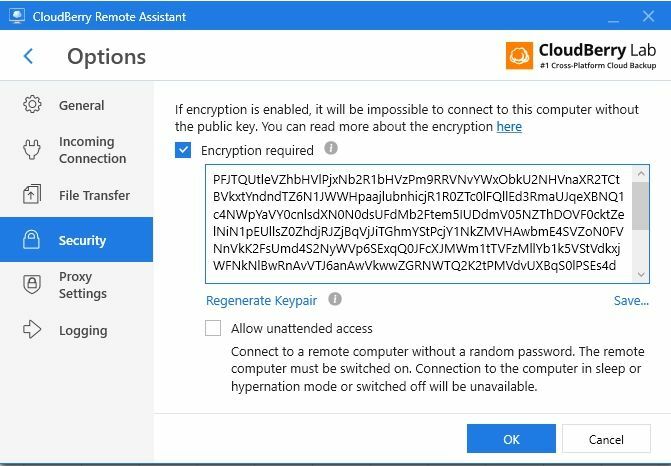 By default, the connection is encrypted with a certificate provided by Cloudberry. That way your session is secure, but in theory, someone having access to the certificate could tap into your session. By using a private security key, the only person having that encryption can access your session, as the key is unique. That way your session is really secure. When a person would like to grant you access to his screen, he or she starts the quick support program. He or she is presented with the Computer ID and Pin number. When you get that number you can connect to his or her computer. 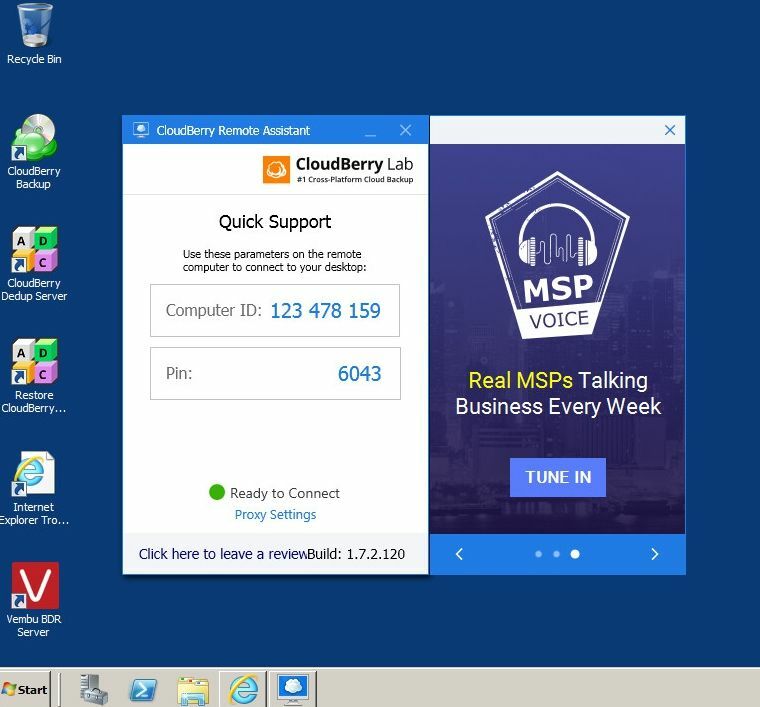 CloudBerry has all the features you can expect from the remote support application. You can enable audio and microphone and you can even transfer files easily. 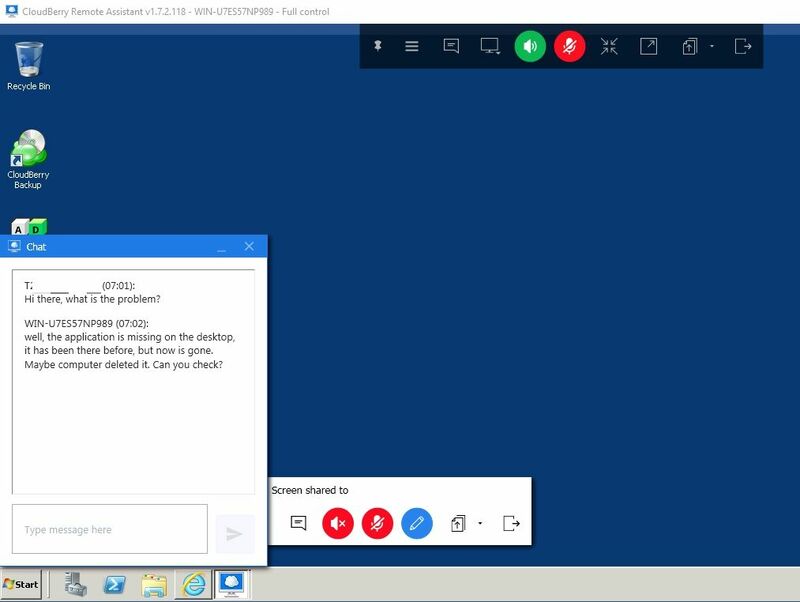 In addition, you can chat via built-in chat so that you can easily communicate about the problems. 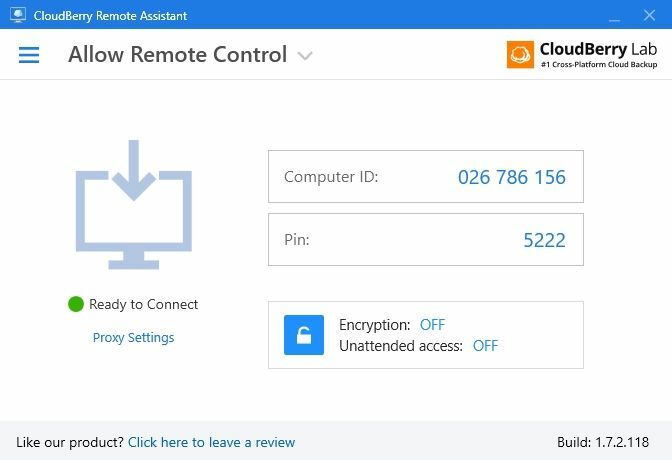 You can also set up CloudBerry Assistant for unattended access. All in all, this program is a gem. Install it, play with it and see for yourseld. After all it is free!